Convert your flat product into a mail-ready envelope. Convert your flat product into a mail-ready envelope with inserts inside through our all in one system; Feed, Score, Collate Inserts, Glue, Fold and Inkjet all in the Same Pass. 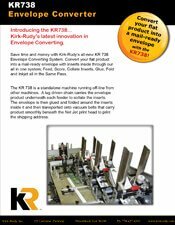 The KR 738 is a standalone machine running off-line from other machines. 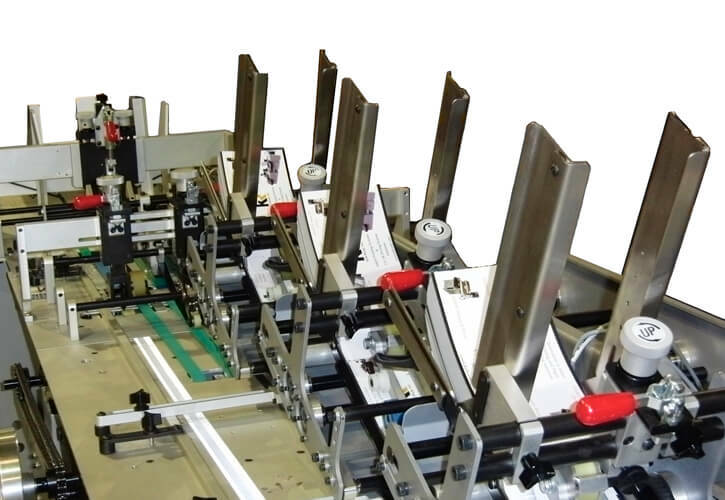 A lug driven chain carries the envelope product underneath each feeder to collate the inserts. The envelope is then glued and folded around the inserts inside it and then transported onto vacuum belts that carry product smoothly beneath the Net Jet print head to print the shipping address.